Pickleball Ready to Play at Holbrook! Pickleball is ready to be played at the newly refinished Holbrook (Muirfield Drive) tennis courts! Join us Monday and Thursday mornings 9:00-11:00 a.m. Beginners are welcome! Pickleball is fun for all ages and a great workout! We have paddles and balls... all equipment is provided! Four brand new courts! There's no cost - just come and join us! 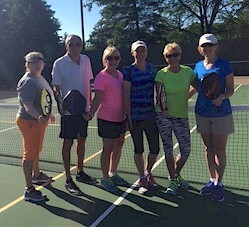 Contact Jackie at [email protected] if you would like to be added to the Muirfield Pickleball email list for updates and news! If you arrive before the group, all Pickleball equipment is located in a locked storage box on the east side of the courts. (Contact the Association office for assistance if needed.) After playing, please return all equipment to the box and lock the box. We hope to see you at Pickleball! Here is the paving schedule for the remainder of the week at the Dublin Interstate 270/US 33 interchange project, weather permitting. 8 PM US 33 east reduced to one lane between SR 161/Post Rd. and Frantz/Post Rd. 9 PM the ramp from I-270 south to US 33 east closed. Detour: I-270 south to Tuttle Crossing Blvd. to I-270 north to US 33 east. 12 AM US 33 east thru lanes to Old Dublin closed and traffic forced to exit at I-270 south. Detour: I-270 south to Tuttle Crossing Blvd. to I-270 north to US 33 east. 5 AM all lanes and ramps open. 8 PM US 33 east reduced to one lane between SR 161/Post Rd. and Avery-Muirfield Drive. 8 PM US 33 east reduced to two lanes between Avery-Muirfield Dr. and Frantz/Post Rd. 9 PM the ramp from US 33 east to I-270 east closed. Detour: I-270 south to Tuttle Crossing Blvd. to I-270 north. 9 PM the ramp from US 33 east to Avery-Muirfield closed. Detour: US 33 east to I-270 south to Tuttle Crossing Blvd. to I-270 north to US 33 west to Avery-Muirfield Dr.
9 PM the ramp from Avery-Muirfield Dr. to US 33 east closed. Detour: US 33 west to SR 161/Post Rd. to US 33 east. For more information, contact [email protected] or at (740) 833-8063.